Shalfleet has achieved its Bronze Award for Sustainable Travel through SUSTRANS! 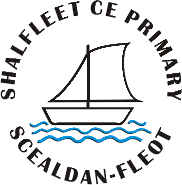 Shalfleet Primary School encourages and supports the whole school community to travel more actively and sustainably where possible. Studies show that travelling actively can help develop physical and mental well-being, social interaction, independent travel skills and good road sense. This helps ready our children for when they leave Shalfleet Primary. We work with a range of external providers, such as Sustrans and the Isle of Wight Council, to keep up-to-date with any appropriate schemes or grants that help us deliver this policy. A very successful “Drop-Off Scheme” operates each morning from 0820hrs – 0830hrs, using the dedicated car pull-in spaces within the school grounds, the children will be greeted and accompanied to the playing field or classroom by one of a number of adult parent/carer volunteers. In conjunction with the “Drop-Off Scheme” we also run a “Pick-Up Scheme”. Our Car Sharing Scheme is one of the main ways of reducing the number of cars coming to school. Please register with the school if you wish to join – where possible we will put you in touch with families in your area or along your route. We would be delighted to know if you are already car sharing! Parents/carers parking on Station Road are reminded of the legal requirement to keep the junction clear and to avoid causing obstruction by parking on the blind bend. We also urge everyone to exercise extreme caution at busy times and show consideration to residents by leaving driveways clear. We are able, by kind permission of Shalfleet Parish Council, to make use of the “Bottle Bank” area immediately adjacent to the Horse & Groom Pub car park. Using the Bottle Bank area for parking does entail crossing the main road, which is often busy and has limited visibility, so extra care needs to be taken. We would strongly recommend use of the Drop-Off and Pick-Up Schemes which eliminate the need to cross the road.